Avery Bundgaard | Daily Press Bay College’s Alfonzo Fields (4) puts up a floater over Lake Superior State’s Jacob Holzhei (14) during the first half Monday at Bay College. 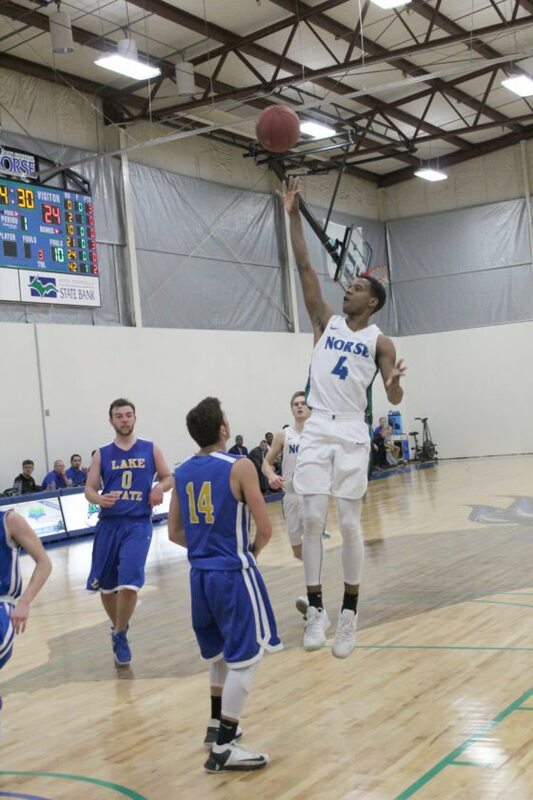 ESCANABA — The Bay College men continued their winning ways Monday night as they rolled to a 91-60 basketball triumph over the Lake Superior State jayvees. This marked the fourth straight victory for the Norse, who improved to 4-3. Bay led 44-28 at halftime. Freshman forward Kobi Lumsden-Barnes then hit the first seven points of the second half to put the Norse up 51-28. Avery Bundgaard | Daily Press Bay College’s Dre’ Tuominen (right) drives baseline against Lake Superior State’s Jacob Holzhei (left) during the first half Monday at Bay College. Willette finished with 22 points and guard Dre’ Tuominen added 14. Bay got its biggest lead with 12 minutes, five seconds left in the game when freshman guard-forward Jace Briggs drained a pair of free throws on a technical foul for a 69-35 advantage. The Norse gained a 25-12 cushion on a gifter by Ellis midway through the first half. 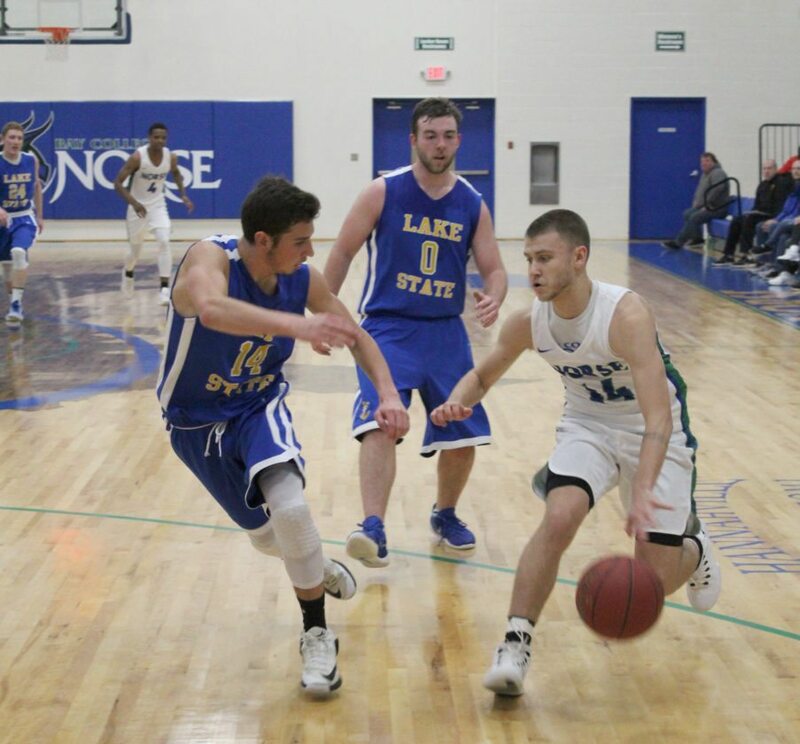 Lake State, however, trimmed its deficit to 31-24 on a trio of charity tosses by freshman guard Jacob Holzhei with 5:29 remaining in the first half of its season-opener. 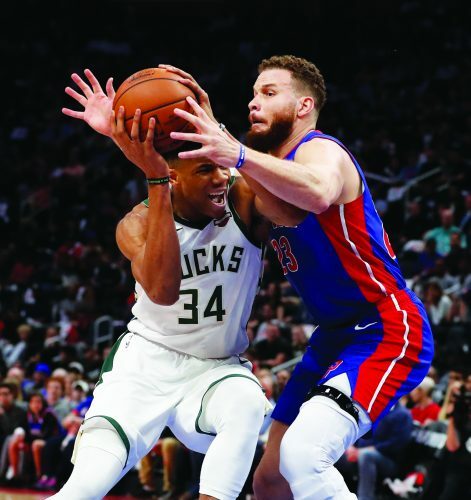 Bay responded with nine unanswered points, gaining a 40-24 advantage on a two-handed dunk by forward Joe Gibbs at 1:45. Lumsden-Barnes finished with nine points and Ellis had eight for the Norse, who hit 24-of-39 free throws and committed 14 turnovers, including nine in the second half. Hunter Schultz, a freshman guard from Republic-Michigamme, scored his first collegiate field goal with less than five minutes remaining in the contest. Holzhei paced the Lakers with 17 points. Tanner Huotari, a sophomore guard from Iron Mountain, added 14 and junior forward Ryan Laprade of Sault Ste. Marie had 12. LSSU finished 17-of-28 from the line and had 16 miscues. Bay travels to Ironwood to play in the Lindquist Classic at Gogebic Community College this weekend, facing Hibbing (Minn.) Community College Saturday at 4 p.m. and Wisconsin-Sheboygan Sunday at 1 (EST). Lake Superior State jayvees — Laprade 12, Arnold 5, Gutierrez 2, Holzhei 17, Purchase 8, Huotari 14, Jones 2. FT: 17-28; F: 25; Fouled out: Laprade, Arnold; Technical foul: Dines; 3-piont field goals: Laprade 3, Holzhei 3, Purchase 2, Huotari. 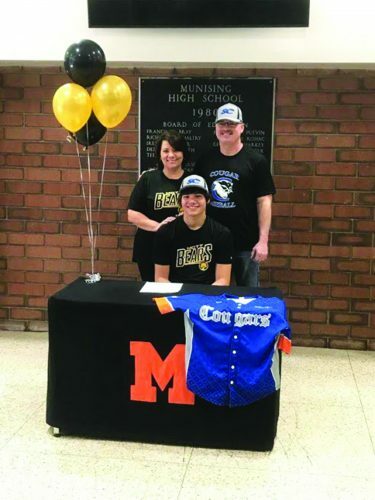 Bay College — Fields 6, Gibbs 6, Ellis 8, Tuominen 14, Schultz 2, Willette 22, McKenney 4, Smith 6, Finkbeiner 2, Richmond 4, Lumsden-Barnes 9, Briggs 7. FT: 24-39; F: 20; Fouled out: Fields; 3-point field goals: Fields, Briggs.